If you are needing some inspiration to help you resist some of the traditional Easter treats around, here is my collection of Easter recipe ideas for you. All in one place for easy access! Beautiful, rose-scented Easter 'Egg' meringues, flavoured and coloured with natural fruits. Crispy, sweet Easter nests sprinkled with dried fruits and filled with white chocolate-dipped grape 'eggs'. Easter Eggypops- Rice krispie and marshmallow eggs covered in chocolate and popped onto a stick with a chick! 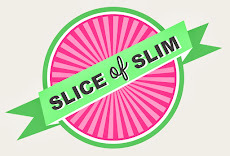 Just to remind all newcomers to Slice-of-Slim, there's a very active Facebook page too- with links to all my latest recipes and lots of daily extra chat...and Twitter too if you'd like to keep up that way. Just click on the 'F' or the Twitter 'bird' at the top right of the blog . Wishing you all a lovely Easter weekend.